Traditional Cretan cuisine is exceptional, even by Greek standards. Its strength lies in fresh ingredients, seasonal fruits and vegetables, wild herbs and the copious use of olive oil. Food is locally produced in nearby farms and villages, and traditional recipes have been cherished for centuries. Socializing is an essential part of eating, hence the habit of sharing food. Cretans are also known for their hospitality and friendliness, and this is particularly true when dining out. In almost every Cretan taverna guests are spoiled with some dessert and a small carafe of raki – on the house. There is no tipping culture in Greece, but voluntary tips are always welcomed. This hard and salty cheese is made primarily of sheep’s milk, but they do sometimes mix it with goat’s milk too. Intense, strong flavour and a slightly fatty texture. Very typical fresh cheese made with whey and milk, usually from sheep or goat. Mild, soft and fresh cheese that turns hard once it dries out. Usually sprinkled on pasta dishes. Also from sheep or goat. Hard cheese made with sheep’s milk and ripened for at least five months. It has a very rich, slightly sweet taste and can be eaten either alone, on bread, or cooked in pies. It takes many days to cook this smoked pork dish – first, the strips of pork are marinated in vinegar for several days. Then the meat is hung above a fire made with sage, bay, and rosemary. The final product can be served fried with herbs or as cold, thin slices. Anticristo is a regional way of grilling meat, mainly sheep and goat, by placing pieces of meat facing each other over a fire. The picturesque village of Anoiga is especially known for their anticristo goat. Chochlioi Boubouristi are snails cooked in olive oil and salt, with sprinkled rosemary on top. This traditional Cretan recipe is so delicious, that it has spread to other parts of Greece as well. Although Crete is an island, it’s noteworthy to mention that traditionally, locals didn’t eat seafood as much as they ate meat. People stayed close to the mountains where they could develop their agriculture and livestock farming in peace – as coastal areas were exposed to pirate and buccaneer raids. Today, there are many seafood tavernas around the island with impressive seafood menus. The seafood is cooked simply – with sea salt and olive oil. These mountain bulbs are gathered from the hillsides around villages and eaten as a fresh salad, dressed with olive oil and lemon or vinegar. The bulbs can also be pickled or put in a stew with oil, vinegar, and flour. 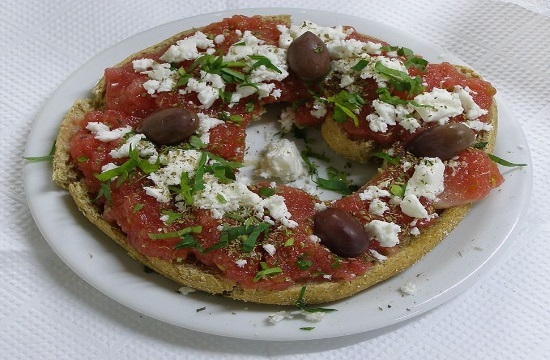 This dish consists of chopped tomato, fresh mizithra, herbs, and olive oil on top of a paximadi, a dried rusk bread. Bite into it carefully, because the hard bread can be difficult to cut! The rusks are usually soaked in water and/or olive oil first to soften them up before serving. What’s a trip to Crete without trying some of their famous olives and extra virgin olive oil? Olives are a good snack with drinks, and dipping freshly-made bread into some Cretan olive oil while waiting for the orektika to arrive can be a heavenly experience. These pies come in many different shapes, most commonly in the form of a tiny cup filled with sweet cheese. The type of cheese used in kalitsounia can change depending on the region of Crete, and they can be either baked or fried. Kalitsounia are a traditional Easter treat and are sometimes served with honey, sesame, and cinnamon on top. This sweet pastry is a speciality of Chania, and traditionally prepared for Epiphany or weddings and engagements. After frying, they are dipped in honey and sprinkled with some crushed almonds. These deep fried small local donuts are sweeter than they look. They are served warm with honey, cinnamon, and nuts, and some people even add ice cream on top. This clear liquor is made during the fall after the grapes are harvested. Since Cretans don’t let anything go to waste, raki is made out of the by-products of the winemaking process. The taste of raki is strong and can vary depending on who made it. Rakomelo is a combination of raki, honey, and spices like cardamom and cinnamon. It’s considered to be high in antioxidants and good for digestion. Crete is one of Greece’s biggest wine producers, and the local wineries are known for their high quality. Several ancient wine varieties grow only on the island and have been preserved since Minoan times.